Soccer is a business. And like most businesses, it’s about results. More wins lead to more points lead to more fans lead to more revenue. I can understand this. Romanticism makes way to pragmatism. I can understand that. Last year’s side didn’t always get the results. 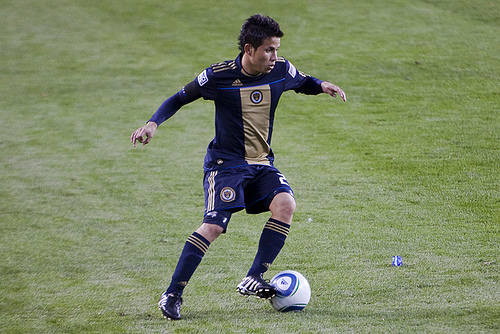 However, the 2010 Philadelphia Union were very much an un-MLS side. They created little triangles all over the field. They kept the ball on the deck. They passed their way out of danger. In short, they played attractive soccer. They created chances and with the help of Sebastien Le Toux and Danny Mwanga, even finished some. Sure, at times they looked completely inept in the back and Seitzy made more than his fair share of howlers, but they were mostly entertaining. Doop 2.0 on the other hand, so far, not so much. I know, I know…they were away and three points on the road surely can’t be cause for complaint. But am I the only one thoroughly underwhelmed and left wanting more? I was greatly encouraged in the offseason by the signing of Columbus Crew midfielder, Brian Carroll, a player with a big engine and a wealth of MLS experience. However, after week one I can’t help but wonder if this is just another player in the Miglioranzi mold- a guy who looks great passing the ball backwards and sideways but never really scares anyone going forward. If Barcelona v. Inter last year in the Champions League taught us anything it’s that possession without penetration is just masturbation. Setting up with two holding midfielders seems to be the modus operandi of Piotr Nowak. Against the Houston Dynamo, the Union effectively employed three with the aforementioned Carroll and Migs joining Kyle Nakazawa in the center of the park. With Mapp failing to get any chalk on his boots and tucking inside, the center of midfield was hopelessly clogged. El Pescadito, admittedly much fitter than the last time he appeared on these shores, didn’t have the dynamism required to sufficiently trouble Houston’s back line. With the superb Brad Davis keeping Sheanon Williams in check all evening, the Union were nonexistent in the final third. The introduction of Danny Mwanga on the hour mark and a tactical shift from the manager injected a bit more life into the game but failed to result in any meaningful chances. It was a bit more adventurous from Nowak but what about all the preseason talk of allowing players to express themselves? The quote about wanting his players to not be afraid to “dribble out of trouble”? It was a cluserf*ck in midfield, an aging relic spearheading the attack and a fortuitous goal off a long throw. Where is the fantasy? The spectacle? Yes, it’s a results business but it’s also an entertainment business. The two players I will always pay to see play are Xavi Hernandez and Paul Scholes. Sure, nothing gets the pulses racing like Lionel Messi carving up defenders on labyrinthine run or gets you out of your seat like that Wayne Rooney overhead kick against City; but for me it’s the the sheer class and elegance of a deep-lying playmaker, a maestro pulling the strings, picking out the pass that no one else sees that makes the beautiful game just that. Where is he in the Union side? Exiled to the bench. His name is Roger Torres. The Union lost their first game against MLS opposition 0-2 on Sunday night in Tampa. Not so bad when you consider that Alejandro Moreno, Danny Califf and Michael Orozco were issued red cards. The first FC Dallas goal came after only 10 minutes when Dax McCarty beat Chris Seitz after a trip down the right sideline. A free kick by David Ferreira in the 76th minute was headed in by Ruben Luna. While details are sparse at the time of writing about the red cards, the best Union scoring chance happened just before half time when Stefani Miglioranzi passed the ball to Roger Torres at the top of the box. 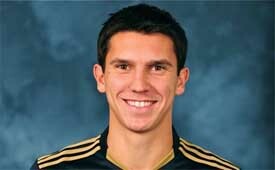 Torres then delivered the ball through the Dallas defense to Sebastien Le Toux. One-on-one with Dallas keeper Kevin Hartman, Le Toux sent the ball over the crossbar.